This page is devoted to the history and development of the Robertson’s Golly Checklist, which is the result of over 30 years of research by the world’s leading collectors to build up an accurate listing of all official Robertson’s Golly material produced over the years. 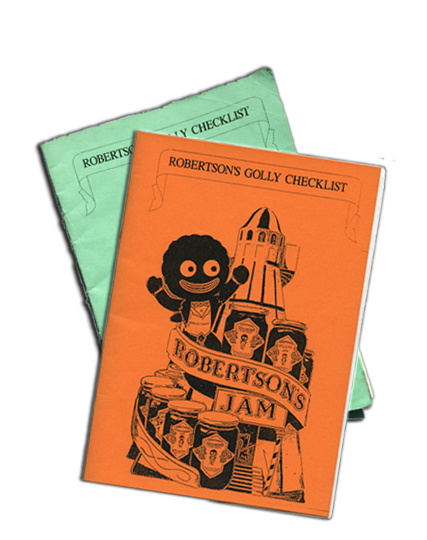 Full details on the history of the Robertson’s Golly itself can be found in the Checklist, which is now available to purchase in our online shop. The famous Robertson’s Golly has been collected by generations of people in the UK - and indeed across the world – since it was adopted as the company’s mascot and trademark around 1910. This was fuelled in no small part by the introduction of a badge collecting scheme which really took off following a meeting between a talented Midlands jeweler called Mr. Miller who was experienced in the technique of enameling on metal, and David Robertson, the Chairman of James Robertson & Sons Ltd in the late 1920’s. Over the years the Robertson’s marketing department turned out literally thousands of golly related items that extended well beyond the highly collectible and much loved badges which are well known by so many, but whilst this was a highly successful business, accurate files as to what exactly was produced were not kept. 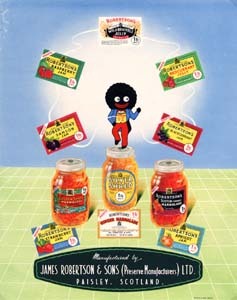 For collectors however, this information forms a vital part of their hobby, but it should be remembered that Robertson’s were first and foremost in the business of selling jam, and so the painstaking task of investigating, researching and cataloguing was left to the collecting community. During the nostalgia ‘boom’ of the 1980’s, the first steps towards addressing this information vacuum were taken by some of the leading members of the Badge Collector’s Circle – a group with a wider interest in button and enamel badges. 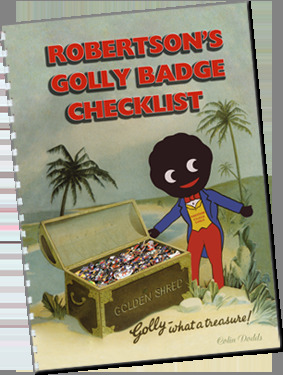 The earliest circulated attempt to catalogue golly items dates back to 1986 and focused solely on Robertson’s most famous creation – the golly badge. Further attempts by leading collectors soon followed, however, it wasn’t for a further five years until the first edition of what quickly became the gold standard in the Golly reference material was produced – the first ‘Golly Checklist’ by Colin Dodds. The meticulous care and attention to detail that went into Colin Dodds’ first checklist was not dissimilar to that employed by Mr. Miller in producing the first enamelled badges all those years before. An example of the quality with which this first checklist was put together is the fact that even after 25 years of further development and the identification of dozens of new badge variations, the numbering system that was assigned to each badge remains virtually unchanged. A further aspect that set it apart from the previous attempts was that, from the start, the Checklist was not limited to the cataloguing of badges only. 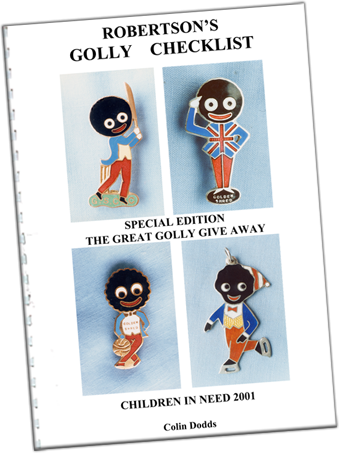 Also included were other official golly related memorabilia produced by Robertson’s such as tableware, figurines, key rings, and jeans patches, as well as guidance on some of the fakes or reproductions that were around at the time. The official memorabilia was an area of the Checklist that was to see considerable extension over the years and the reason why so many collectors have now extended their initial collection of golly badges into other areas of interest. As new items came to light over the years the Checklist became too extensive to produce in a single printed version and so, shortly after Robertson’s announcement of their intention to retire their Golly mascot in 2001, the first steps into the digital era were taken with the production of the Golly Guide on CD Rom. The development of the Golly Checklist itself makes for a fascinating study and so this page has been included to show how the current material came into existence. The current Golly Checklist can trace its roots back to 1986 when Joyce Mellor produced the first printed record specifically for members of the Badge Collectors Circle. This early document was a concise record charting the main variations, and consisted of three single sided pages of A4 and a cover sheet with 21 badges. It is interesting to note that even in these early days all 20 of the Miller prewar cricketers were recorded – including the most desirable badge of all, the famous ‘Golden Shred Cricket Club’ badge. However, the document contained only the briefest mention of some of the maker’s involved in the white waistcoat era and simply listed the eleven designs that were produced, which left collectors eager for more details. Only a small number of copies were distributed; it is unknown how many originals still exist. Ian Craig is probably best known as the artist behind the 1980’s Collectors Scrolls but he was also one of the first to attempt a golly checklist. Proudly titled “The Definitive Golly Brooch Checklist”, this three-page booklet catalogued the available badges in a numbered list that covered 177 in total. Much to collectors delight, a lot more detail was included around the white waistcoat badges and for the first time the short lived but beautifully enamelled silver sporting pendant designs of the late 70’s/early 80’s were recorded. The third page of the booklet contained a list of other badges produced by Miller including Song Badges and Childrens Club Badges – reflecting the broader appeal that this booklet was intended to have, as it was once again available to members of the Badge Collectors Circle. Sensing that the desire for detailed information amongst keen golly collectors had not been satisfied, Colin Dodds set about the significant task of producing the most comprehensive Checklist yet. 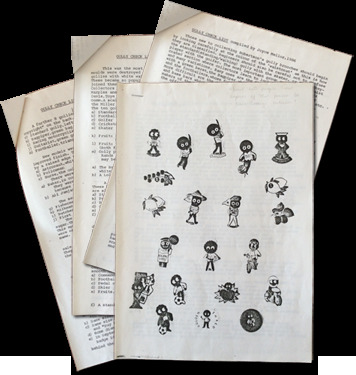 Listing all known variations with checkboxes to record against, the first edition of his now famous Golly Checklist was the product of over 5 years of careful research and contained a staggering 575 badge variations in a concise A5 stapled book running to an impressive 33 pages. 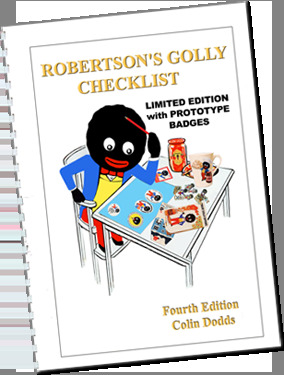 The Checklist included computer generated depictions of 30 different backstamps and, in addition to 16 pages on golly badges alone, contained dedicated sections on golly balloon badges, button badges, pendants and paper tokens as well as related Robertson’s memorabilia such as tableware, figurines and jean patches. Advice was also given on reproductions and counterfeits that were known at the time. Needless to say it was an immediate hit with collectors and very quickly became the gold standard against which all enthusiasts recorded their collections. A status that is now firmly established amongst collectors to this day. The colour of the cover varied depending on what colour could be source at the time - shown here in orange and green. Such was the extent of golly related material produced by Robertson’s that new items were being regularly identified. Further careful research and cataloguing saw the second edition follow only two years later with the introduction of the trademark pink cover. In a ringbound A4 size, it was extended to 48 pages and contained over 250 hand drawn images to assist collectors. Whole pages were dedicated to the Fattorini backstamps, the Miller backstamps and images of the white waistcoat standards. However the main difference from the first version was the attention given to the non badge items; ‘Jar Lids’, ‘Jar Tokens’, ‘Card Adverts, ‘Other Shop Items’ and ‘Golly Offer Leaflets’ sections were all added, and the ‘Miscellaneous Items’ grew from 9 items to 34. 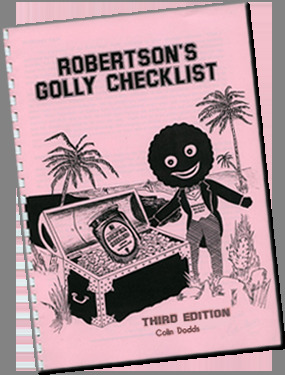 By the time the third edition arrived in 1997 the Golly Checklist was well established as the collector’s guide to Robertson’s Golly material. Improvements were made to the clarity and layout and even though the font size was reduced to fit more in, it still almost doubled to 80 pages! Robertson’s themselves requested and received a copy as well as some of the UK’s leading auction houses. Once again the memorabilia section saw the biggest change, as a direct result of the growing interest amongst collectors for the various related items. Following new research the ‘Golly Paper Tokens’ section was completely rewritten and a section appeared for the first time on the magazine and newspaper adverts. With over one thousand three hundred items of memorabilia alone, the list was now enormous and the number of illustrations had to be considerably increased. 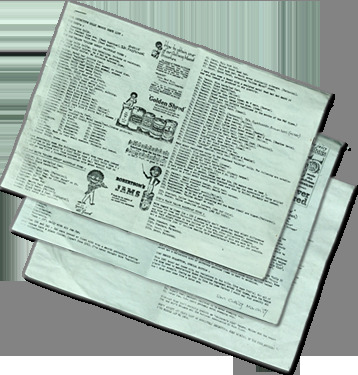 A special version of the third edition Checklist was produced as part of The Great Golly Giveaway that was organized for the 2001 Children in Need appeal. Four rare items appeared in full colour on the special front cover. The Checklist was sold on eBay with all proceeds going towards The Great Golly Giveaway. One copy only. Following shortly after the sudden retirement of the Robertson’s Golly, which was announced, to everyone’s surprise in 2001, the Checklist’s next incarnation was not in hard copy, instead it was to make its first appearance in a digital format via CD Rom. This enabled a much larger amount of material to be presented, with extensive commentary on previously unknown areas of research, and for the first time collectors were able to view all items in full colour with over 2400 high quality images. 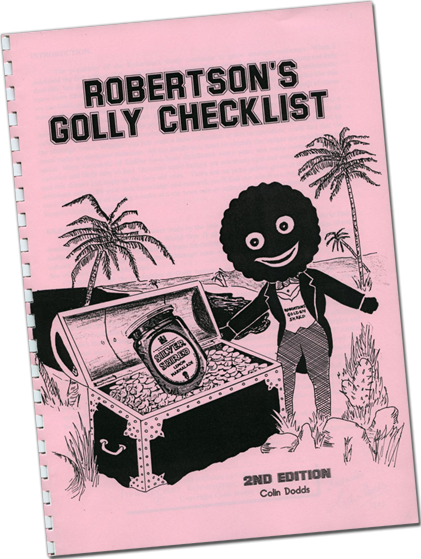 Known as the Robertson’s Golly Guide it was sold with a single user license and collectors were encouraged to print off their own checklists for personal use from the tables within. Reaction to the new format was overwhelmingly positive and once again the bar had been raised. 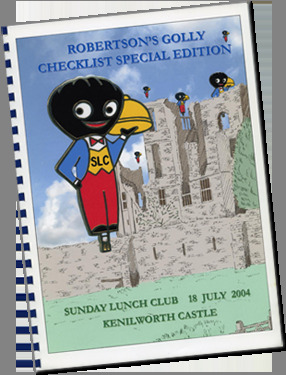 The fourth edition of the printed Checklist followed shortly after the Robertsons Golly Guide. Intended to complement it as a handy reference for collectors to take out and about, it was brought into line with the latest available information. Again the tables saw size reductions in order to fit as much information as possible into a manageable printable version but it still ran to 91 pages. ‘Tableware’ which saw a further twenty one items - eleven of which were mugs! for the first time an attempt was made to list the enamel signs. 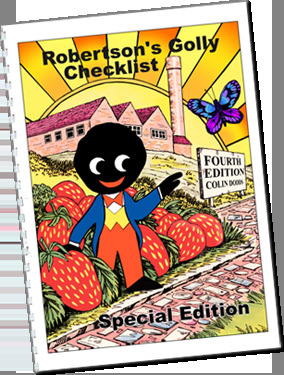 The second charity special was based on the fourth edition Golly Checklist and showed a full colour cover of the ‘Golly & Strawberries’ design based on the Jigsaw (item number G19). In support of the Tsunami appeal in 2004 the third charity special was released. Again based on the fourth edition Checklist, the cover page confirmed its status as a limited edition with full colour pages of the prototypes. All sales proceeds going to the Tsunami appeal. Signed by the author. Two copies only. The fourth charity special was released in July 2004 to mark the inflation of the hot air balloon known as Golly III – at the time of its original launch in 1977 it was the UK’s first special shape balloon. The inflation was originally planned to take place in Stoneleigh Abbey but due to the weather conditions it had to be changed to Kenilworth Castle, which meant a frantic last minute update to the Checklist cover! All proceeds going to Helen & Douglas house Hospice. Three copies only. The fifth update to the Checklist was not available in hard copy as it was incorporated into the updated Golly Guide, now in its second edition, the look and feel was consistent with the original Guide but a lot of extras were included. New badges, new backstamps and full details of all prototypes known to exist made this an essential part of any serious golly collection. Four years of further research added hundreds of items to the listings which now included over 4200 full colour illustrations. By popular demand the sixth edition of the checklist was released in print in 2008. However, the number of items of Robertson’s memorabilia now catalogued had become so large that it was not possible to include them in a single printed volume, and so the sixth edition Checklist concentrated on the Robertson’s badges, buttons and pendants – and this time in more detail than ever before. Unbelievably, all previous drawings were digitally reproduced and many more included for the first time to give over 500 images at an outstanding level of clarity. Despite omitting the memorabilia section it still ran to a staggering 87 pages and included a complete section on prototypes in print for the first time along with a ratings system to give collectors an idea of rarity. the bulk of the Robertson’s Golly history had now been pieced together and those who share the passion for collecting Robertson’s badges or other memorabilia with be forever indebted to the one person who oversaw this incredible piece of work… Colin Dodds. Despite no update to the Golly Checklist for almost ten years, collectors continued to discover new items and in 2015, Colin Dodds invited Zanny Garbett to join him to collaborate on the 7th Edition of the printed Robertson's Golly Checklist. Containing over 700 detailed images across 130 pages packed full of the latest information on all known badges and pendants, it is the most complete record of Robertson's badges ever produced. The seventh edition of the checklist is unrecognisable from those that have gone before as all makers backstamps have been redrawn, all tables have been reformatted and all text has been re-examined to make this the most extensive and accurate listing ever. In addition to the updated Checklist, for the first time collectors also receive a full colour handout showing how many badges from each era make up the official listing. With a total of 779 badges making up the official listing this is the ideal way to keep track of your own collection whilst you hunt out those elusive items. After 3 years in development, the Robertson's Golly Guide 3rd edition was launched to collectors at the 2018 Sunday Lunch Club meeting at Burford in Oxfordshire. Although it is built on the content of the 2nd edition Guide on CD-Rom, the format was completely updated to launch in a new digital format. For the first time ever, the Golly Guide was made available online via a subscription service for collectors to be able to log in and keep up to date with the latest information. The benefit of this new platform is the ability for collectors to view updates to the content as and when they are made available... not something that could be done with a printed version. 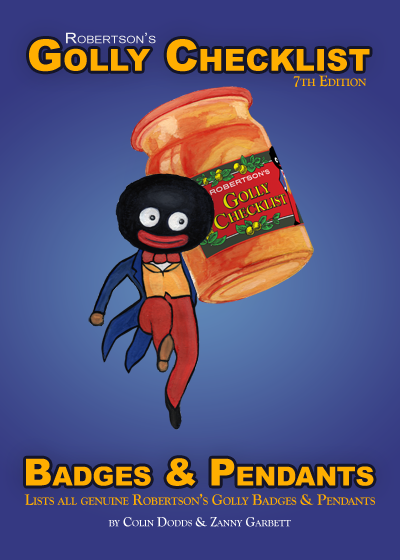 At the launch date, the Badges and Pendants sections were consistent with seventh edition printed Golly Checklist and the authors make regular updates to the content (usually weekly). With over 10,000 images and thousands of items across 26 sections this is the most complete record of Official Robertson's Golly items ever created.